In August, I bought a new cookbook: The Perfect Cookie. It's from America's Test Kitchen. I've bookmarked a lot of delicious sounding cookies. Hopefully there will be lots of baking in the coming weeks. 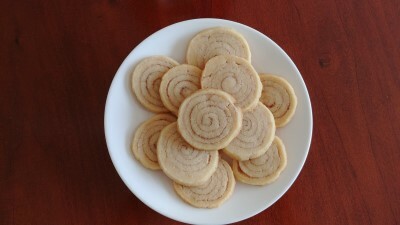 The first cookie we baked: Cinnamon Swirl Cookies. I love cinnamon and it seemed like a small step to fall flavors. 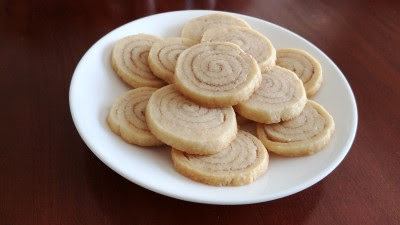 Also, it seemed like maybe it could replace the Cinnamon Bun Pinwheel Cookies that we think are really tasty but that we dislike making because the cinnamon dough can be difficult to work with. These are pretty easy to make, easier then the Cinnamon Bun Pinwheels. They're tasty, too, but I think we should have baked them another 1-2 minutes. They were a little soft in the middle. But lots of sweet cinnamon flavor. A buttery cookie dough with a swirl of cinnamon sugar - we'd definitely make these again.